Anyone who has seen Star Wars: The Force Awakens will instantly recognize the scene on Takodana as shown here, where Finn uses Luke Skywalker’s light saber to battle against Kylo Ren and the First Order Stormtroopers! This replica sets the scene at Maz Kanata’s bar and includes 5 mini figures as well as sliding doors, an exploding wall, a collapsing staircase and a falling tree! 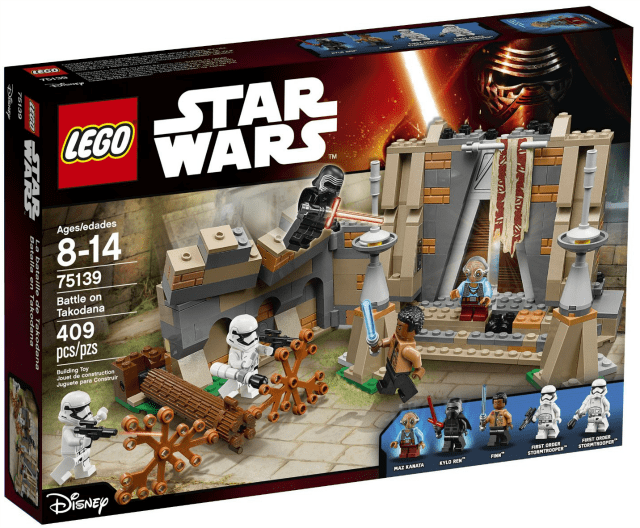 This is a 409 piece set that is sure to be popular among Star Wars fans, particularly for the inclusion of film favorites Kylo Ren, Finn, and, of course, the breakout star of Star Wars: The Force Awakens, TR-8R! In essence, this is a set with 2 walls and a number of admittedly excellent mini figures. Although the scene is instantly recognizable as Takodana – the home of Maz Kanata, that is mostly thanks to the entrance gate and tribal flag that hangs over it. That being said, there is no denying the quality of the mini figures, which sell individually for close to the collective cost of this set. Kylo Ren and Fin are two of the main stars of the film, but the inclusion of Maz Kanata and the amusing named TR-8R will be of particular interest to fans. The Stormtrooper TR-8R is so-called as he is the one who battles Fin in the film, with Fin wielding a light saber and TR-8R utilizing a force baton. The scene was a highlight of the film, and it is fantastic to see the character recognized in the set. Ultimately, the Battle on Takodana is a nice set with a number of excellent characters. The falling tree, collapsible staircase and exploding wall are good features that aid fun and imaginative play. Fans will buy this set for the figures included more so than the set, but young children will thoroughly enjoy it regardless. « Three Halloween Duct Tape Projects Your Kids Will Love!